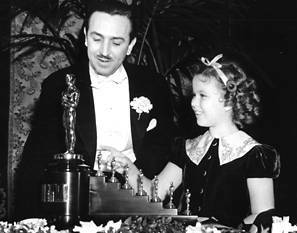 The 10th Academy Awards was a unique event for the Disney Studios: Snow White and the Seven Dwarfs received a nomination for best score, and The Old Mill won for best animated short. It was March 10th, 1938 at the Biltmore Hotel (a week late due to flooding), and Art Babbitt was there with his young wife Marge, a 16mm camera and a roll of COLOR film. This entry was posted in 1932-1941: Disney Glory Days, Animation, Disney, Film, Hollywood, Photography, Snow White and the Seven Dwarfs and tagged 1930s, Academy Awards, Art Babbitt, Ceci lB. Demille, Frank Capra, Home Movies, Hymie Fink, Jack Warner, Leo McCarey, Louis B. Mayer, Luella Parsons, Luise Rainer, Mack Sennett, Marge Champion, Oscars, Shirley Temple, W. C. Fields, Walt Disney. Bookmark the permalink. Remarkable color footage, thank you for posting. It looks like the Academy Award presentation back then was a loose, fun-filled affair, unlike the self-inflated, pretentious event we see today. The lady with the flowers in her hair and the dark dress next to Frank Capra is Louise Tracy, wife of Spencer Tracy, who accepted his Oscar that night I beleive. That’s Louella Parsons with DeMille and Capra. Does anybody know the whose who in the “The bowl of the Biltmore Hotel (at the previous year’s Oscar ceremony)” Could that be Errol Flynn on the far left of the photo facing left, with perhaps Jack Warner to his right? Would be fun to know whose who in this picture. Half of Walt Disney’s face is visible in the bottom right corner of the photo, second from the right along the bottom edge.